I must give credit to my friend, Francisco López Castro, who’s from Espejo, Córdoba, for this recipe. 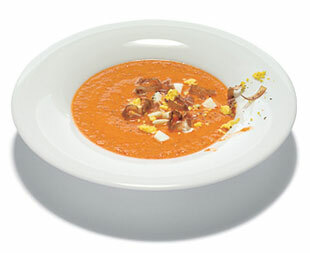 Spanish gazpacho has a looser consistency, whereas salmorejo is creamier and smoother. Preparation: In a large bowl place about 5 large (2 lbs. ), VERY ripe red tomatoes. (preferably the kind you see at the Farmer’s Market). Peeled, Cut into chunks. Shredded day old bread (½ a French baguette is an excellent bread choice for this.) Avoid using the very hard ridges. ¼ c. extra virgin olive oil (the better the quality of the oil, the better the taste. Trader Joe’s has a Spanish Olive Oil that is excellent for the price). Place the peeled, and cut tomatoes in a large bowl, along with the shredded bread and the oil. Let it sit for 10 minutes. You want all the ingredients to mesh w/one another And the bread to get soaked with the juices of the tomato and the olive oil. Place ingredients in blender and add desired salt and garlic clove. If the soup is not sufficiently creamy add a bit more bread with a little olive oil. Test, taste, and balance the flavors out. Editors Note: For a more elaborate recipe, we are including the link to Bon Appetit magazine’s Salmorejo .